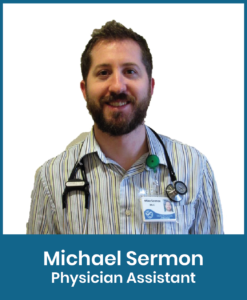 Michael Sermon is a certified physician assistant who joined Columbia River Health in 2015. Michael was born and raised in Utah, where he completed his bachelor degree in Exercise Science at Utah State University in 2010. He completed his Masters in Physician Assistant Sciences in May of 2012 at Saint Francis University in Loretto, Pennsylvania. He then began his career in the Friona, Texas where he practiced family medicine and worked in the emergency room from 2012 – 2015. He is particularly interested in family medicine because it allows him to be an active participant in the care of his patients through the lifespan. He firmly believes that not everything can be fixed with a pill, and that the basic principles of regular exercise and healthy balanced diet are vital to good overall health. He is grateful to serve the community, and looks forward to partnering with patients to help them attain their health goals. He enjoys spending time with his wife and 3 young children. He also enjoys the outdoors, hiking, ice hockey, mountain/road biking and playing music in his free time.